Long, long ago in a galaxy far away (actually this one) I fell in love with harmony. Not just any harmony; the best by Take 6. Anyone that knows me knows that I love a large variety of music… you can probably hear that in most of my arrangements for Naturally 7. Hip hop, R&B, Gospel, Pop, Rock, Jazz, classical… it’s kinda all in there. I truly love music if it just makes sense. But I should tell you there was a time when I only listened to one album. I would say for almost two years in “88” and “89”. You guessed it, the first album titled “Take 6”. I don’t know how many of you out there have ever gone through a period like that. It’s not that I didn’t care about anything else. I just needed time to wrap my head around what I was listening to :-). And once I get into something, I go all the way! I first heard the group perform in 1987 at a Baptist Church in Brooklyn. I brought my whole group which lived in a world called “Three-part Harmony”. My cousin Jason Thomas introduced me to Take 6 years earlier as Alliance and told me all sorts of tall tales about them, and I believed it all because we had no photos, no internet, no info — just the demo tape. The visual aspect changed in the summer of 87 while attending Camp Victory Lake in New York. I saw a man (Ted Rivers, I believe) playing a video tape of them. I couldn’t believe it. That’s Alliance!!?? I thought there were eight members, but no… only six. I was glued to the TV screen. They were singing a song called “Sunday’s on the Way” and it was amazing! They did a few things I hadn’t seen before; they were actually holding six microphones. Now that may seem run of the mill to you here in 2011, but it was brand new to me then. Traditionally harmony groups gathered around one mic or any amount less than the number of persons. I could tell you another hundred things they did different but that would go too long (you can ask me later if you really want to know)… but they all inspired me! And that’s why, when I heard they were coming to New York later that year, I brought my whole group! That concert changed the direction of my life. I loved every minute of it. I still remember the five songs: “Get Away, Jordan”, “If We Ever”, “David and Goliath”, “Sunday’s on the Way” and “Mary”. They announced that night that they were changing their name from Alliance to Take 6, and to look out for the new Warner Bros album in January of 88′. The reason I know all this verbatim is we taped it and I listened to that cassette until it wore out! I mean, you really could just about hear the harmony in the first place! I went on to see them about 20+ times over the next three or four years and always enjoyed myself and hoped I’d be able to tour one day like them, doing what I love most. In 2001, I hit the road full time with Nat7 and we went on to create our own style of A cappella known all around the world as “Vocal Play”… Amen! We dug deep to find our unique path and learned how to embrace what came “Natural” to us; finding the music and talents that God had blessed us with. But I want you all to know that without the inspiration of Take 6 so many years earlier, we wouldn’t have even believed that it was possible to do anything A cappella as a career! After 10 years of touring, this was actually the first time that both groups were in the same city (St Louis) performing. We decided to meet after their show and just share our thoughts. Here it is caught on video. Not the best quality, but it’s quality. 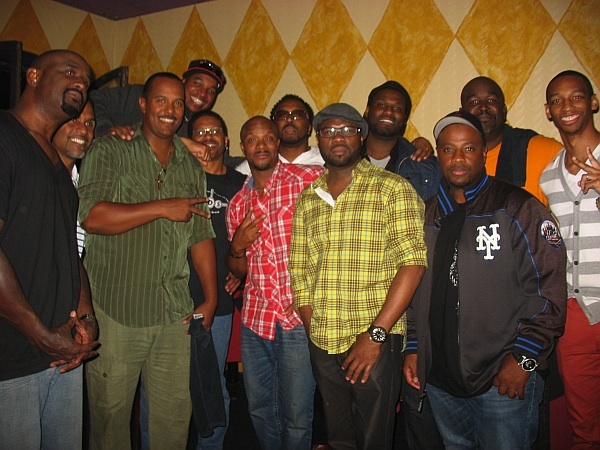 As Rod says in the video… We “Naturally 7” take our hats off for Take 6. This entry was posted in Roundtrips and tagged St. Louis, Take 6. Bookmark the permalink. I was in high school when Take 6’s first album released. As a freshman at Howard University I wore that same cassette tape out DAILY, blown away by their intricate harmony. I was blessed when they partnered with Joe Sample for my personal 1989 Song of the Year: “U Turn”. As the song says, it got me “up and going” to class EVERY SINGLE MORNING. I depended on it. I had NO idea years later I’d meet Joey and Mark Kibble, become buddies, and that Joey & Karima would lead me into the 7th-day Adventist Church. And now I’m working for Naturally 7. This was a monumental moment for me as well although I wasn’t there, but was on the phone with Mark and Roger making sure we documented this event properly. Both groups mean the world to me as friends and industry colleagues. Let’s hope we can get “Take 13 Naturally” or whatever we’ll call this ensemble, in the same city to do a song together sooner than later. Reading N’glish’s blog and watching this historic video of N7 together with Take 6 brings tears to my eyes. As a good friend of mine says about N7 each time she hears you sing live … ‘You made me cry!!!’. It’s actually thanks to Naturally 7 that I was first introduced to the music of Take 6. After going to watch a Take 6 show I could see immediately what a huge influence Take 6 have been on N7 but, I”m pretty sure I could also see some influences from N7 reflected in Take 6’s performance too. In any event, I would agree with the old adage ‘imitation is the sincerest form of flattery’. Watching the video, it is wonderful to see such mutual appreciation between the two groups with Naturally 7 holding Take 6 in such high regard and vice versa. “We are so proud of what you guys are doing. To see it taken to the next level and seeing the successes that you guys are having across the world. That is just way awesome”. I very much hope N7 and Take 6 get a chance to work on something together in the near future. It would be a blissfully harmonic vocal symphony of talent – that’s for sure! Like I told Roger on FB…This post — like so many of the others — brought tears to my eyes, The intersection of Talent, Passion, Prayers and God is one amazing thing to watch. Thanks for letting us all be a part of your journey. I hope you’re blessed over time to meet those who have been inspired by Naturally7’s performances and follow in your footsteps. I am so thrilled that you guys got together … I have pretty much worn out my Take 6 cassettes from playing them so much! Am getting close to wearing out my N7 CDs now — what a blessing you and Take 7 have been to me! NICE! You 13 would be awesome, but I’m greedy. I want all 19 (adding the 6 in Committed). I have a vision for it! I was a senior majoring in Voice Performance in tiny college in Central Florida when I was given a cassette of Take 6’s demo. As a music major their harmonies were an absolute marvel to me. I remember the pure joy I got when I heard it; and Sunday’s On the Way & David & Goliath made a HUGE impression on me. I listened to that tape until it fell apart! Now that is pure unadulterated LOVE!! !